Suitcase corners can be attached to the corners of a case, but also in many other articles in order to protect the edges against damage. ► Reliable protection of the edges of suitcases, boxes and more against damage. ► Appreciation of the case / the box by the elegant look of the corner protectors. 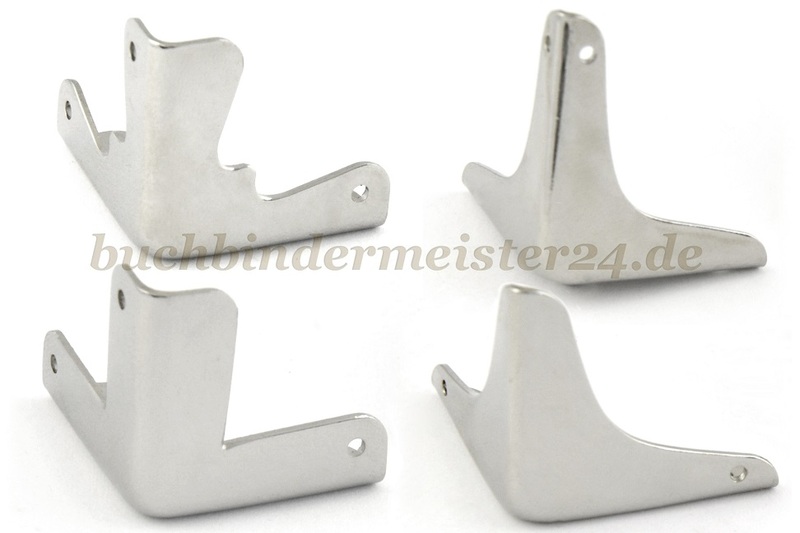 ► Suitcase corner protectors are easy to assemble. By mounting of suitcase protective corners (also called suitcase corners) the corners of suitcases are reliably protected against damage. But not only cases can be protected by case corners, but also boxes and other storage items made of metal, wood, cardboard or plastic. The case corner protectors are made of metal and therefore they are very robust and resistant, even with heavy use of the article. Extend the service life of your product through the use of case corners. Not only the protection and thus the service life is increased through the use of case corner protectors, but also the external appearance is increased by the mounting of suitcase corners. The shiny nickel-plated surface of the suitcase corners has a very high quality appearance and is a good contrast to dark suitcases or boxes. Our suitcases corner protectors have mounting holes, which facilitates assembling of the suitcase corners. So you can easily fix the suitcase protection corners with rivets or nails to your suitcase or box. If you want no holes in the case or the Box the case corners can also be glued. There are several case corners to choose from. You can choose between different sizes and designs. There are both small and larger suitcase corner protectors available. For classical objects, the elegant design with curved legs is recommended. Very practical is the version with slide feet which increase the lubricity of suitcases or boxes.